Peracetic Acid Market size was estimated over USD 645 million in 2017 and will exhibit growth of over 8.5% up to 2025. The need for protecting and improving public health is said to foster the peracetic acid market growth in the forecast timeframe. During the processing and handling of food & beverages, necessary sanitary practices cannot be overlooked. Hygiene practices need to be at the best possible conditions. Unhygienic practices in these facilities can result in various undesirable outcomes which might further lead to devastating effects. Contamination of a batch of food or beverage will not only lead to product loss for the company but will also create critical situations for public health. These situations cannot be rectified quickly, thereby damaging the image and brad name of the concerned company. Rapid growth in population, changing lifestyles and eating habits of consumers is said to trigger the processed food industry demand especially in the developed and developing countries. Corporate working hours and increasing female working population is propelling the packaging food demand globally. Processed and frozen food needs the usage of various chemicals and additives for preservation of quality, freshness, taste, etc. Peracetic acid market demand is fostered by the product’s applications in the food and beverage industry as an antimicrobial agent for preserving food for later consumption. Use of antimicrobial agent is very essential for obtaining the best possible resulting in food preserving. The product has been recognized by the U.S. Food and Drug Administration (FDA) as a safe chemical for food protection. These factors will push the market demand to new heights. This product is an organic compound known for its high corrosiveness. Prolonged contact to peracetic acid is said to have adverse health effects such as allergy and irritation to skin, eyes, etc. Moreover, higher concentration of peracetic acid can also cause respiratory symptoms and other such severe health hazards. These factors may result in slower peracetic acid market growth in the forecast period. Based on product, the global peracetic acid market is segmented into solution and distilled grade. The solution grade product is produced with various concentration levels of PAA. Some of the popular concentration levels for include the 12% and 15% of PAA. Under special circumstances, solution grade of more than 35% concentration is also produced. The solution grade segment held the highest market share in 2017 and is said to do so till the end of the forecast time spell. 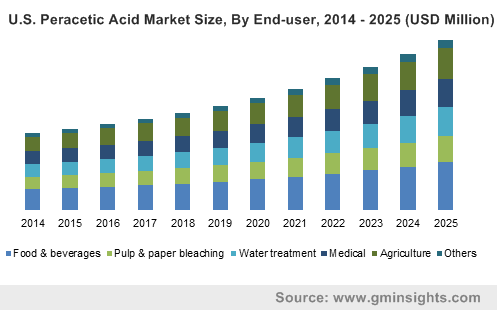 The end-users for peracetic acid market is segmented into pulp & paper bleaching, food & beverage, water treatment, medical, agriculture, and others. Vast growth in food & beverage industry especially in the developing countries is said to foster the market growth in the coming years. In the U.S., the food & beverage segment was accounted for over USD 35 million with a CAGR of approximately 8.5%. Peracetic acid market is also said to witness strong growth avenues from the pulp and paper bleaching industry. The Germany pulp and paper bleaching segment captured a market share of over 15% in terms of volume and is said to grow with a CAGR of over 8%. Increasing bleaching activities in the pulp and paper industry is said to push the market further. 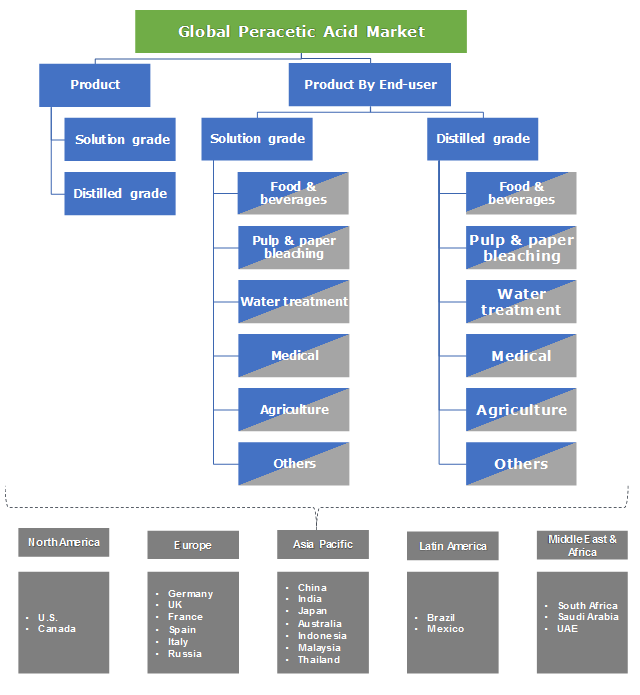 Based on geography, the peracetic acid market is led by the North American region followed by Asia Pacific. Due to strong growth avenues in the Asia Pacific, the region is said to grow at a highest CAGR to be the leading region by the end of the forecast time frame. Asia Pacific is said to grow with a CAGR of approximately 9% followed by Latin American region. Increasing industrialization activities in the countries of Latin America is said to define its growth rate. The north American region is led by the U.S. owing to huge number of industrial activities and companies present in the country. In terms of volume, Saudi Arabia accounted for roughly 30% of the overall industry share in the Middle East & African region. The Saudi Arabia market accounted for close to USD 12 million in 2017 to grow with a decent CAGR in the forecast period. Players present in the global peracetic acid market include some of the huge players as well as small companies competing for notable profits in the industry. Some of the companies competing in the market include Solvay, Kemira, Evonik, Mitsubishi, Peroxychem, Thai Peroxide, Ecolab, SEITZ, Hydrite Chemical, Loeffler Chemical Corporation, Enviro Tech Chemical Services, Diversey, Airedale Chemical Company, and Acuro Organics to name a few. Recently in 2017, Evonik Corporation’s popular brand Peraclean 22 CW was approved by the Food and Drug Administration (FDA) and United States Department of Agriculture (USDA) for its usage in poultry and meat processing. The product is a peracetic acid which is chlorine-free and stable solution with no harmful byproduct. Peracetic acid market is majorly driven by the food & beverage industry owing to the extensive use of the product as an antimicrobial and disinfecting agent. The main advantages of the product especially in the food & beverage industry is that it controls odor and is an effective agent against a wide range of micro-organisms. Moreover, the product operates in a broad temperature range and leaves no toxic residues. These superior factors of the product as a preservation agent is said to propel the market growth in the forecast period.